Officials in 2008 sign the agreement to establish RIT Dubai. 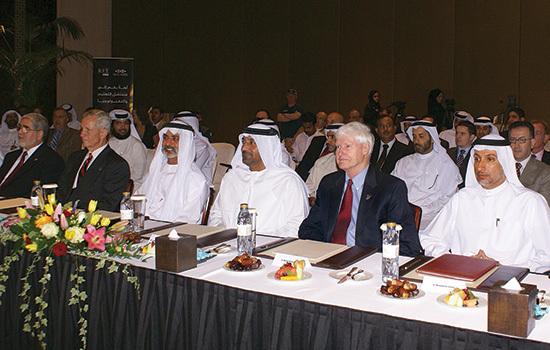 From left, Mustafa Abushagur; the late Mike Morley, former chairman of the RIT Board of Trustees; His Highness Sheikh Nahayan bin Mubarak al Nahayan, minister for higher education and scientific research; His Highness Sheikh Ahmed bin Saeed Al Maktoum, chairman of Dubai Silicon Oasis Authority; Bill Destler, RIT president; Mohammed Al Zarooni, vice chairman and CEO of Dubai Silicon Oasis Authority. Mustafa Abushagur was just a young man when he left his country and his family in the late 1970s, dissatisfied with the direction Libya was taking. Libyan dictator Moammar Gadhafi was attempting to control citizens within the country by imprisonment and public hangings—and outside the country through a campaign to assassinate Libyan dissidents living abroad. More than 30 years would pass before Abushagur could return. In that time, the professor of electrical engineering in RIT’s Kate Gleason College of Engineering and former president of RIT Dubai saw personal, academic and business successes. He would use lessons from those successes to become part of his country’s history as its first elected prime minister. Although he’d be prime minister for only a short time, Abushagur made an impact and continues to help reshape Libya’s future. 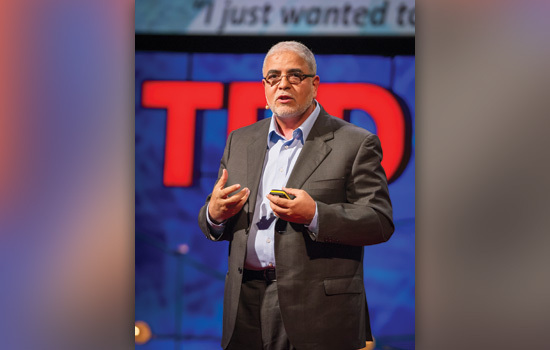 Wherever he’s been in his distinguished career, Abushagur has found a way to build what had not been there before—programs, colleges, a sense of community—and now, a new foundation for his homeland. Throughout high school and into college in the early 1970s, Abushagur watched Libya become more restricted. Libya was a monarchy until Gadhafi deposed King Idris in 1969. Gadhafi’s controlling grip tightened around the country almost immediately, and a military presence soon became as prominent as the Greco-Roman ruins across the countryside. In a public speech shortly after taking power, Gadhafi stated that Libya needed national unity free of party activities, and that those engaged in these activities were committing treason. Opposition groups formed, several on university campuses, and Abushagur became involved while he attended the University of Tripoli. He joined the National Front for the Salvation of Libya and participated in public protests challenging the government’s policies, and he opposed a dictator who favored a privileged few, he says. Abushagur graduated from the university in 1974 with a degree in electrical engineering, and the following year he enrolled at California Institute of Technology to pursue a master’s degree and doctorate. But even though he was living in the United States, he continued participating in the opposition group. In 1981, his name was placed on Libya’s most wanted list for his activities. Under torture, many individuals confessed to crimes against the government that they did not commit, and Abushagur’s name was mentioned in some of these confessions. The confessions brought problems for Abushagur and his family. Authorities questioned them and confiscated their passports. Abushagur was torn between supporting the opposition and worrying about family members who remained in Libya. Abushagur had returned to Libya between terms at Caltech, once in 1977 to get married, and then again in 1980. During the latter visit, it would take more than a month for him to get an exit visa arranged. It was the last time he saw the Libya of his youth. Politics were set aside temporarily. Abushagur and his wife, Fatma, began their family. Keeping them safe would be difficult, but “at the same time, it was fundamental; we needed to stand for the rights of our people. And my family understood that,” he says. He began teaching at the University of Rochester in 1984 and a year later joined the University of Alabama-Huntsville, where he’d spend 17 years as a professor of electrical and computer engineering and professor of optical science. As an early innovator in micro-photonic devices and optical communications, he created one of the first optical engineering degree programs in the country and formed two optical-networking companies, Photronix and LiquidLight Inc. 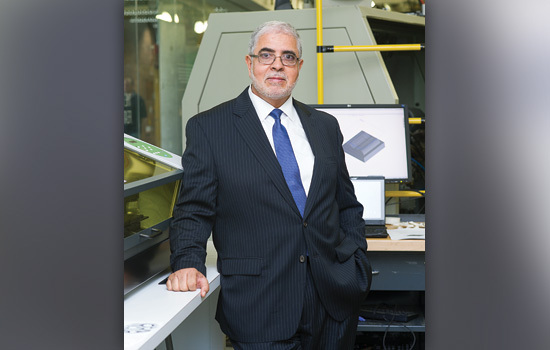 This work brought him to RIT in 2002, where he established the microsystems engineering doctoral degree program. This, too, would be the first of its kind in the nation. Abushagur set the foundation for the sophisticated research in optical signal processing, nanotechnology and micro-photonic devices that continues at RIT today. Students from around the world have come for the program—several because of Abushagur. Abdelsalam Aboketaf is nearly the same age now as Abushagur was when he left Libya. He, too, began studies in Libya and traveled abroad for graduate school. Aboketaf continued his studies, and like his friend and mentor, intends to return to Libya to be part of its rebuilding process. About that same time, RIT began a global push to establish a satellite college in Dubai. Negotiating that would take a leader with business acumen, academic experience and an ability to connect two diverse cultures. RIT Provost Jeremy Haefner says the international connections Abushagur developed as an engineer made RIT Dubai a reality. “He believed this was a real opportunity, and he was aware of the role that we needed to play in setting up a program of the highest caliber, and what Dubai leaders needed to get out of this relationship as well,” Haefner says. RIT Dubai was established in 2008, supported by its government and accredited by its Ministry of Higher Education. Abushagur was named president and helped establish both undergraduate and graduate programs. Abushagur was committed to RIT Dubai, but he also kept in touch with colleagues as a revolution was growing in Libya. Within three years of setting the foundation for RIT Dubai, he would be considering another life change. Gadhafi was overthrown in 2011. One of Abushagur’s contemporaries, Abdulrahim El-Keib, was selected to lead the transitional government, and Abushagur was asked to assume the role of deputy prime minister. Haefner agreed but also acknowledged some concern for his colleague’s physical safety and an unexpected mix of emotions. In May 2011, Abushagur returned to Libya during the revolution. The eastern part of the country was liberated first, and the National Transitional Council was formed. It also marked the return of many émigrés like Abushagur. Yet, what he also saw was a country that wanted change and people who wanted to influence that change. New political parties were formed where once they were not allowed and elections took place in 2012. The General National Congress opened voting for the new prime minister on Sept. 13. By midday, Abushagur was one of several leaders tied for the position. In a run off, he was elected by two votes. Abushagur’s victory was short-lived but significant. “It was still a difficult time to form a government, and in the end, the two largest parties decided to vote me out after four weeks because I would not yield to their demands to form a government based on regional and party quotas,” he says. It’s been two years since the Libyan Revolution unfolded. Much remains to be settled in the country. Abushagur and several colleagues established the Libyan Policy Institute. As its chairman, he oversees research and policy analysis about economic, social and cultural developments in the country that has an abundance of resources, including a youthful population and vast oil reserves that can be the cornerstone of a new Libya. Abushagur lives in Libya but regularly visits the United States and Rochester for business and for family. The youngest of his five children, Noor, is a second-year international business student in RIT’s Saunders College of Business. He also remains a part of the RIT family on extended leave. He hopes to one day establish stronger relationships between Libyan universities and universities around the world, such as RIT. Abushagur is setting an example of someone who left his country but never abandoned it.